Since March 2002, BMW has offered the ‘BMW Motorrad Navigator’ road navigation GPS to individuals looking for guidance on their motorcycling adventures. Now its successor, the BMW Motorrad Navigator II, is available and features key upgrades to make it an even better travel companion. Faster and better performance A significantly-faster RISC (Reduced Instruction Set Computer) processor combined with an integrated USB (Universal Serial Bus) connection make data transfer from PC to Navigator easier and virtually instantaneous. Developed in cooperation with the navigation specialists at Garmin International, the new BMW Motorrad Navigator II now utilizes readily-available CompactFlash memory cards. Internal memory has been also expanded, now featuring a massive 512 MB of storage space, allowing huge areas of map data to be stored. Simple operation In addition to the familiar features of its predecessor, the BMW Motorrad Navigator II offers fourteen menu languages and touch-screen capabilities that simplify operation-finding your destination couldn’t be any easier. By touching the anti-glare screen, selecting the “Food & Drink” menu will list all registered restaurants in your area arranged by proximity. You can even choose food subcategories (i.e. Italian) and then select any standard navigation function using the touch screen to get to your destination quickly. The exclusive BMW-designed Advanced Motorcycle Mount Cradle functions as an extended operation unit specifically for BMW Motorcycle riders and features four buttons, which can be operated while wearing gloves. The cradle also has a supplemental audio connector, offering verbal directions in your choice of nine languages. In addition, the BMW mount is programmed and recognized by every BMW Navigator II when installed. BMW Motorcycles equipped with the ComSystem and V.O.I.C.E. communication systems will benefit by the BMW Navigator II. The sleek new design now incorporates the satellite antenna inside the BMW Navigator II. Also unique to the Navigator II is the fuel- and splash-resistant housing that minimizes damage from fuel vapors while refueling. 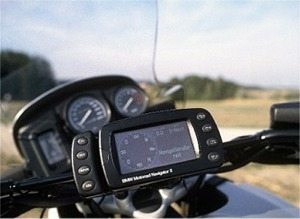 The BMW Motorrad Navigator II is supplied with the latest MapSource North America v5 CD software for easy downloading of detailed maps of the U.S. and Canada, as well as everything necessary for automobile use, including a portable beanbag mount, power adapter with speaker and new portable remote control. The new Navigator II will be available in Spring 2004 from all BMW Motorrad USA retailers and will retail for $ 1,495.00. – Advanced mount cradle with 4 additional buttons and audio jack that only works with the Navigator II.